Il 4 novembre, 1966 il fiume Arno ha allagato la citta di Firenze dopo tanti giorni di pioggia in la campagna. E stato l’inondazione peggiore che ci sia mai stato in la citta e ha coperto tanti edifici alle secondo piano. Ha danneggiato o ha distrutto tanti libri antico e opere d’arte inestimabili. On the 4 November, 1966, Florence was inundated by the waters of the Arno River following many days of rain in the surrounding area. The flood is said to have been the worst in the recorded history of the city and covered the buildings up to the second floor. The destruction to priceless works of art and books was unimaginable. There are still markers in many places around the town indicating the top of the flood waters. 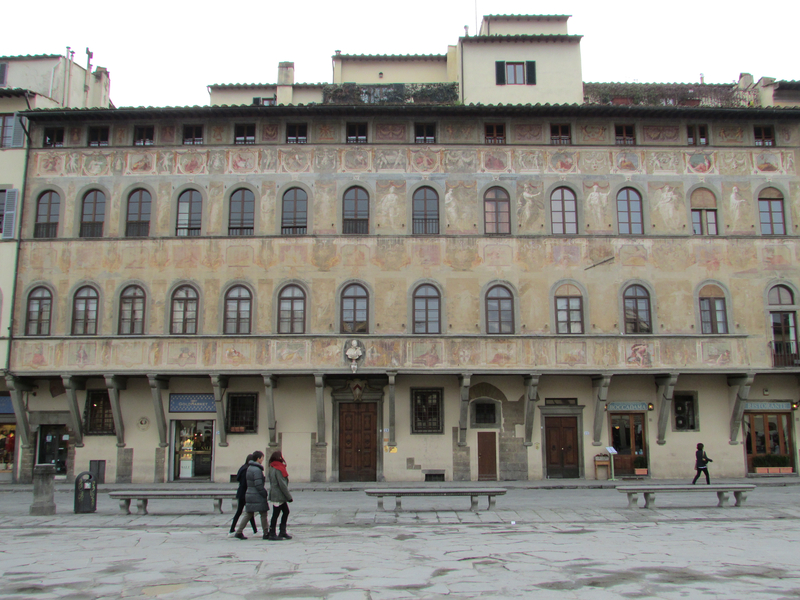 The Church of Santa Croce has a gallery of photographs taken at the time. Tanti persone giovani da tutto il mondo erano andati a firenze aiutare. Sono stati soprannominati Angeli del Fango. C’è un monumento sulla riva meridionale commemorare loro azioni. The young people from around the world who came to Florence in response to the flood were dubbed by the locals as Angels of the Mud. They are commemorated with a monument which stands on the southern bank of the Arno at the start of the Lungarno Benvenuto Cellini. Prima di mio primo soggiorno in Firenze, avevo letto “The Sixteen Pleasures” di Robert Hellenga. La storia è ambientata a Firenze dopo i alluvione e si racconta di una giovane donna che andò a Firenze aiutare salvare i libri. Lei ha incontrato un uomo sposato più vecchio. Lui era abitato in un appartamento dava su Piazza Santa Croce. Quando io vado là, mi piace immaginare io so dove lui era abitato. Il dicembre prossimo vivrò in appartamento del miei sogni in Palazzo Antelesi. Before I went to Florence for the first time I read a novel called The Sixteen Pleasures by Robert Hellenga which is set in Florence after the flood and is about an Young American woman who goes there to help save the books. She meets an older, married man. He lives in apartment overlooking the Piazza Santa Croce. Each time I have been to the city, I go to the the piazza and imagine I know where he lived. Next December I will be living in Palazzo Antellesi which is the place of my dreams.